RV Roof Maintenance - in Trailer Life! RV Roof Maintenace – in Trailer Life! 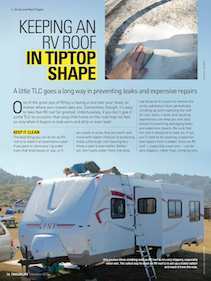 The September 2013 issue of Trailer Life includes a technical feature of ours about RV roof maintenance and repair. This seems like a pretty mundane topic, but we actually got quite wrapped up in it as we uncovered the many subtleties involved in keeping shelter over our heads on the road. It turns out that RV roofs come in many flavors, from rubber roofs to fiberglass, and each has its own requirements for maintenance and repair. Mark and I worked together on this article, and when we sent it off to Trailer Life, we thought it was finished. However, TL’s technical team had a lot more tips to add! So, in the end, this article has the input of four or five different people who have owned a wide variety of RVs (not just trailers). A little side note: I took this fun photo of Mark working on the roof of our first full-time trailer (a 2007 27′ Fleetwood Lynx travel trailer with a non-walk-on roof) not when he was cleaning or repairing the roof, but when he was installing our first solar panel! We were dry-camping at Westport-Union Landing State Beach campground, a fabulous campground on a bluff overlooking the ocean in northern California. He managed to install the whole system in one day while dry-camping, and he was under the gun too, because he had to get it done before our one battery got too discharged… He’s amazing!! Trailer Life is a monthly RVing magazine published by Good Sam Club. It can be found on newsstands and in camping stores.